Ztory secures funding from D-Ax and Wellington Partners and increases its market presence locally and globally. D-Ax, a partnership between well-known Swedish conglomerate Axel Johnson AB and a group of digital experts, RECAPEX, have invested in Ztory. This is co-investment with Wellington Partners. Stockholm and London – 16 September 2014 - Ztory, the subscription service for digital publications, has received a huge vote of confidence with an injection of capital and expertise from Swedish D-Ax, consisting of Axel Johnson AB and RECAPEX (Internet entrepreneurs who, among other things, founded Match.com and Bookatable), and UK based Wellington Partners Capital - well known as successful early investors in companies such as Hailo, YPlan and Spotify. With the funding, Ztory will now strengthening its market presence in the fast growing international digital magazine market. Ztory was founded in the summer of 2013 by a team that was formed back in 2009, working to help publishers find new readers and revenue streams through digital distribution. The founders of Ztory recognized, at an early stage, the importance of digital sales for publishers and have been working since to find a solution that appeals to both publishers and readers. Product innovation is key for getting magazine lovers to rediscover the joy of beautifully illustrated and well-produced publications and, at the same time and through this, increase the willingness to pay for good stories. “The choice of investors to join our team at Ztory has been extremely important for us to ensure that - in addition to extra capital - they bring to the table the experience, knowledge and networks needed to offer a world class digital subscription service for both publishers and readers,” Nima Samimi, President and founder of Ztory, says. “Behind Ztory there is a technological and data-driven team with a long history and passion for a business where the new digital consumer is now the driving force behind powerful disruptive change. Just like in the music industry, this creates great opportunities for early market players to establish sustainable revenue models for content providers and additionally win users' hearts. What Ztory is about to accomplish is exactly what drives us to invest and is something that we are really excited about becoming part of,” Johan Siwers of RECAPEX, says. Ztory is a subscription service for illustrated publications such as magazines, bookazines, visual facts and children's books. Ztory’s goal is to allow readers to keep updated and be even more inspired when they read about their areas of interest. Today Ztory distributes nearly 500 titles and 7,000 publications. Users of the service receive unlimited access to the entire range, as well as being able to take advantage of a growing library of children's books at a fixed price of 99 SEK a month. As a subscriber, users can create up to five user profiles so that everyone in the household can read their own favorite magazines; create reading lists and bookmark items for a personal and unique reading experience. Ztory was founded in 2013 and currently has offices in Karlstad, Stockholm and Barcelona. D-Ax is a joint venture between Axel Johnson AB and RECAPEX, which was initiated in 2013. D-Ax aims to facilitate investments in digital projects and innovative companies, primarily in the Nordic region. 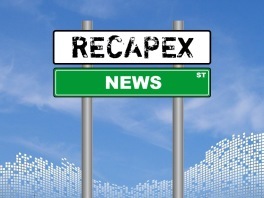 The collaboration combines Axel Johnson AB’s experience and breadth of traditional retail, trade and services with RECAPEX’s network and expertise within digital businesses.